The much anticipated Sugarpill Sparkle Baby Collection palette is finally here! If you loved Sugarpill's last palette, Cold Chemistry (check out my review and look here), then you'll love this one as well. The style of this palette is quite the opposite of Cold Chemistry with it's cute, pastel-ribbon-kitten-sparkly packaging, and it's all around adorable and gorgeous! You get a nice array of unique, candy-like colors that are smooth, pigmented and beautiful - just what you expect from Sugarpill! 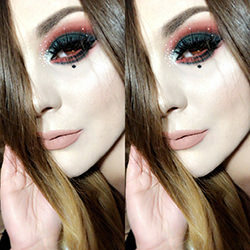 When I was done with this look, it reminded me of a colorful, modern twist of 60's eye makeup, which I think looks pretty neat, especially with a light color in the crease instead of a darker shade. It gives its a nice, unique twist. First off, please excuse these photos; my camera was acting up and I had to photograph the palette with my iPhone. Hopefully they're decent! How adorable is the design on the inside of Sugarpill's shipping boxes? Cute in every way! The palette comes packaged in a sleek and compact cardboard palette with a matching sleeve. Inside the palette, you get four full-sized eyeshadows and a nice sized mirror. The mirror isn't hinged so you'd have to prop it up against something or hold it if you want to use it to apply your makeup. Kitten Parade is a super shimmery, peachy-coral shade with a beautiful golden sheen. This also works great as a blush and/or cheek highlight! This is the sheerest of the bunch, but is buildable especially with a white base. Frostine is a frosty, pastel lavender that has a satin finish. This is the least shimmery of the four shadows and has a slight blue sheen to it. CandyCrush is a super shimmery, pearly, light minty green-blue. Hotsy Totsy is my favorite shade in this collection! It's a bright magenta color with iridescent sparkles that can also be used as a blush. From left to right: Kitten Parade, Frostine, CandyCrush and Hotsy Totsy - swatched on bare skin. Overall, this palette is a must have for any Sugarpill or color fan. You get great quality eyeshadows and a nice variety of shades that can work together, on their own or with other shadows. A couple of these eyeshadows also double as cheek products, so that's another plus! 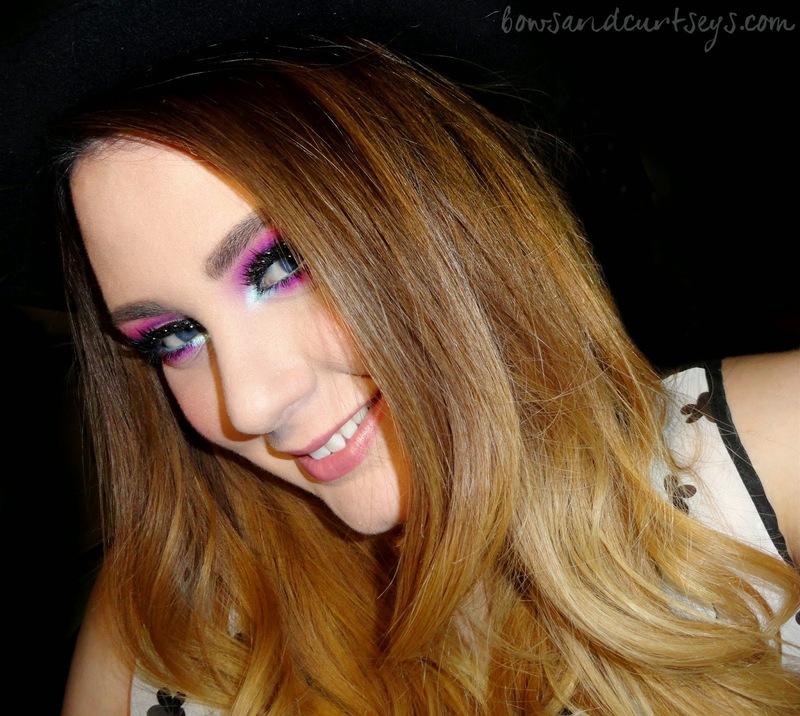 You can always count on Sugarpill for bright, colorful and pigmented makeup that is of high quality. Their pigmentation is seriously amazing and they're so smooth and long-lasting. There's a reason why they're loved by so many! The Sparkle Baby palette is currently priced at $34. The shadows are also sold individually for $12 (you save $12 buying the palette and it's like getting one for free, wee!). Check out www.sugarpillshop.com if you're interested and also check out what else they have to offer! I hope you guys enjoyed this review and look! I sure had fun playing with these gorgeous shadows and putting this look together for you guys.